Diligent detective work and the refusal of a Glendale police sergeant to let a case go led to the arrest last week of a murder suspect in a death that occurred almost 19 years ago. Harley Spencer, 59, formerly known as Eugene Colomvaro, lives in Clinton, Utah, and was arrested by that city’s police after Glendale police determined he was responsible for the death of a 6-yesr-old boy. The death occurred Sept. 27, 1983, at a Glendale apartment complex. Police investigated a call that a child, Adam Clark, wasn’t breathing. Adam had been left in the care of Spencer, a friend of Adam’s mother. 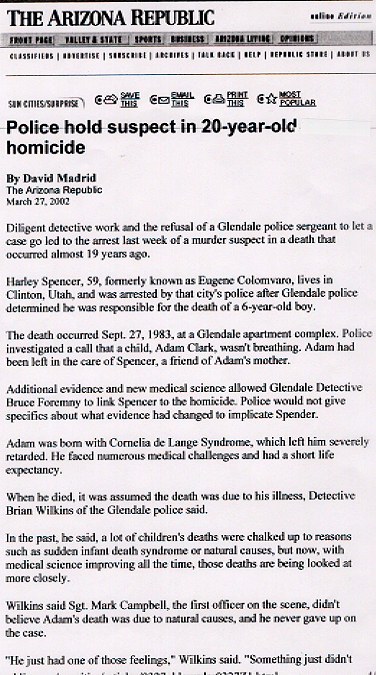 Additional evidence and new medical science allowed Glendale Detective Bruce Foremny to link Spencer to the homicide. Police would not give specifics about what evidence had changed to implicate Spender. Adam was born with Cornelia de Lange Syndrome, which left him severely retarded. He faced numerous medical challenges and had a short life expectancy. When he died, it was assumed the death was due to his illness, Detective Brian Wilkins of the Glendale police said. In the past, he said, a lot of children’s deaths were chalked up to reasons such as sudden infant death syndrome or natural causes, but now, with medical science improving all the time, those deaths are being looked at more closely. Wilkins said Sgt. Mark Campbell, the first officer on the scene, didn’t believe Adam’s death was due to natural causes, and he never gave up on the case. “He just had one of those feelings,” Wilkins said. “Something just didn’t seem right to him.” When detectives were looking over old, unsolved cases, Campbell suggested they look at this one again. Foremny, who has extensive child-abuse investigative experience, followed through on the case and with the help of the medical examiner and new ethnology, police now believe Spencer was responsible for the death. Glendale – Almost 20 years after a 6-year-old boy was killed in his Glendale home, police have arrested a suspect in the case. Eugene Colomvaro, 49, was arrested Wednesday in his Utah home. He will be extradited to Arizona where he will be charged with the murder of Adam Clark, a mentally retarded boy who was in the care of Colombaro at the time of his death. Glendale police attributed the arrest to “new medical science breakthroughs, additional evidence and the diligence of Sgt. Mark Campbell,” who was the first officer to respond to the 1983 slaying. The mother of a 6-year-old Glendale boy who was murdered 19 years ago minced no words on Wednesday in a Phoenix courtroom. Joyce Clark made an emotional presentation shortly before the convicted killer, Harley Spencer, 60, of Clinton, Utah, was sentenced to an 18-year prison term. Clark, 49, stood to address the court, then turned to Spencer, also known as Eugene Colomvaro, and vented nearly two decades of feelings. “He was a special child and you murdered him,” Clark said as Spencer sat quietly, his face buried in clenched fingers. Clark described her mentally and physically handicapped child as “a little elf boy.” She told Spencer that Adam now sits in heaven telling the “Heavenly Father” the awful things that were done to him. Later, Spencer denied any responsibility, telling a judge he’s innocent and feels sorry for Adam and his family. “I don’t know who killed Adam, and I swear on the body of my dead mother it was not me,” Spencer told the court, making a pleas for leniency. Judge Warren Granville of Maricopa County Superior Court disagreed, saying the evidence at trial clearly showed Adam was brutally beaten to death after the mother had entrusted Spencer, a friend, with the care of her young son. Outside the courtroom, Clark gave a thumbs-up when asked to comment about the 18-year prison term. Allen Clark, her former husband, thanked a prosecutor for winning a murder conviction and bringing closure. Spencer, who was found guilty Nov. 21 of second-degree murder, was arrested last year after a renewed investigation by Glendale Police in the unsolved 1983 slaying. Jeannette Gallagher, a deputy county attorney, said justice hs been done, because Spencer killed a helpless boy and got away with murder or 19 years. Adam Benjamin Clark, a 6-year-old Glendale boy, weighed just 22 pounds when he was murdered in 1983. A defenseless child born with serious mental and physical handicaps, he was beaten to death. According to family photos posted on the Internet, he was a towhead with a fetching grin. Even though Adam was small, he has remained larger than life for people who remember him. The investigation into who killed Adam took a false step in the mid-1980’s, then languished for more than a dozen years. However, perseverance by Glendale police and a renewed look at medical evidence have been credited for bringing a man long suspected in Adam’s death to justice. On Nov. 21, Harley Spencer, 60, formerly known as Eugene Colomvaro, was found guilty of second-degree murder. The jury verdict came after a nearly two-week trial in Maricopa County Superior Court. Spencer, a resident of Clinton, Utah, a small town southwest of Ogden, is scheduled for sentencing Wednesday. Sgt. Mark Campbell, 44, a Glendale officer, described the verdict as probably the most satisfying moment of his 22 years in law enforcement. When Adam died, Campbell was the first officer on the scene and cradles the boy in his arms and administered CPR in an attempt to save him. Campbell said Adam’s mother, Joyce, 49, once charged in the slaying, and the boy’s older sister, XXXXX, now 26, also were on hand when the jurors returned their verdict. He described them as reserved people who don’t want to comment about the case until after Spencer is sentenced. Taking the stand in h is own defense, Spencer denied killing the boy. His lawyer, Vicki Lopez, a deputy public defender, has advised him not to discuss the case before sentencing. Lopez said she believes there was “ample reasonable doubt” upon which the jurors could have acquitted Spencer. Campbell said his involvement dates from the night of Sept. 27, 1983, when he was on a routine patrol, driving through the parking lot of an apartment complex in the 6100 block of North 55th Avenue. Campbell said he observed a man, later identified as Spencer, saying good-bye to somebody in a car, later determined to be Adam’s mother. An hour later, the observation became significant when he was dispatched to the complex for a call about a boy who had stopped breathing. Campbell said that is when he encountered Spencer, who had been taking care of Adam in the absence of his mother. Campbell administered CPR until Glendale firefighters arrived and rushed Adam to a Glendale hospital, where the boy was pronounced dead. 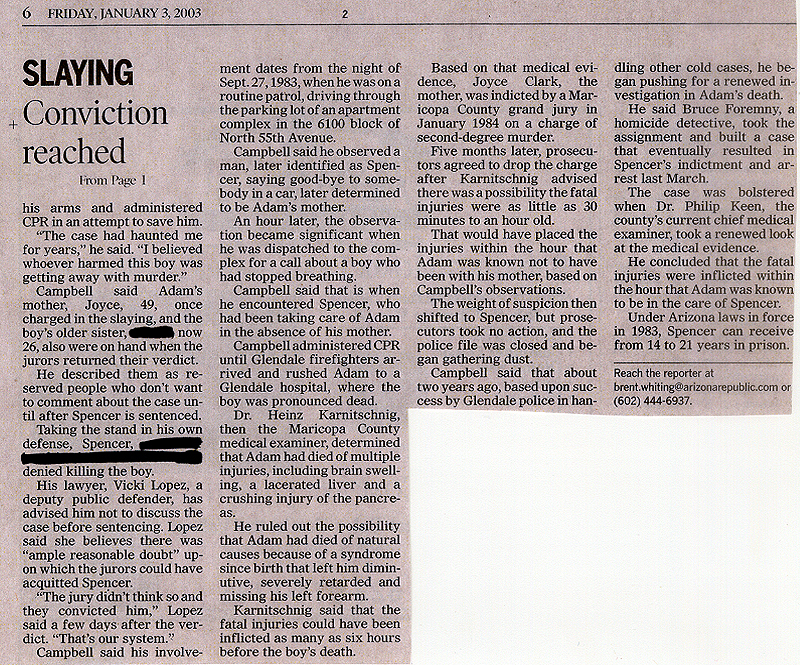 Dr. Heinz Karnitschnig, then the Maricopa County medical examiner, determined that Adam had died of multiple injuries, including brain swelling, a lacerated liver and a crushing injury of the pancreas. He ruled out the possibility that Adam had died of natural causes because of a syndrome since birth that left him diminutive, severely retarded and missing his left forearm. Karnitschnig said that the fatal injuries could have been inflicted as many as six hours before the boy’s death. 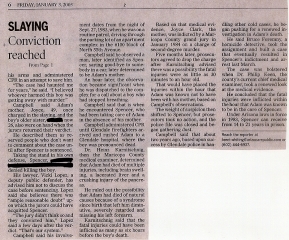 Based on that medical evidence, Joyce Clark, the mother, was indicted by a Maricopa County grand jury in January 1984 on a charge of second-degree murder. Five months later, prosecutors agreed to drop the charge after Karnitschnig advised there was a possibility the fatal injuries were as little as 30 minutes to an hour old. That would have placed the injuries within the hour that Adam was known not to have been with his mother, based on Campbell’s observations. The weight of suspicion then shifted to Spencer, but prosecutors took no action, and the police file was closed and began gathering dust. Campbell said that about two years ago, based upon success by Glendale police in handling other cold cases, he began pushing for a renewed investigation in Adam’s death. He said Bruce Foremny, a homicide detective, took the assignment and built a case that eventually resulted in Spencer’s indictment and arrest last March. The case was bolstered when Dr. Keen, the county’s current chief medical examiner, took a renewed look at the medical evidence. He concluded that the fatal injuries were inflicted within the hour that Adam was known to be in the care of Spencer. Under Arizona laws in force in 1983, Spencer can receive from 14-21 years in prison.